Part 1: Making Wikipedia "GLAM-friendly"
Recently there has been a flurry of activity in the Gallery, Library, Archive and Museum (GLAM) sector about how they can be more “Wikipedia-friendly” both directly and indirectly. But, what’s been happening in the Wikimedia world to make it more “GLAM-friendly”? Actually, a fair bit. 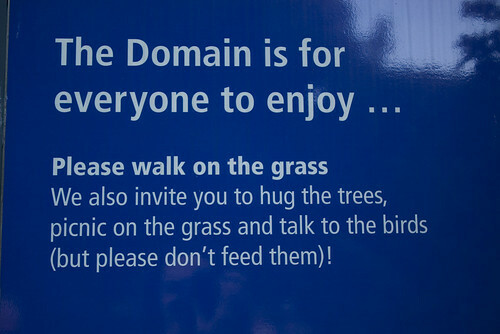 [This is the sign outside “the Domain“, a public park in Sydney, but I would like to think that it applies equally to the Public Domain of creative works. Creative works should be used, not just admired from behind a fence]. But before I get to that (in part 2), here is blogpost part 1. listing just some of the things coming out of the GLAM sector that Wikimedians might be interested in. It goes on to explicitly discuss the possibility of working with Wikipedia in linking out to library’s special collection archives. Discoverable – it is where I am and where I look for it. Meaningful – I can understand it. Responsive – to my interests, mood, location. Usable/Shareable – I can pass it on. Available in three locations – online, onsite and offsite. Combine these simple rules with the Powerhouse Museum’s funky new strategic plan (2009-2012) which calls for “Dissolve boundaries between exhibitions, programs, publications and web content” and “Increase the level of collection information available through open access…” and you have a museum that is trying to lead the way in being open to Wikipedians using and reusing their content. With that kind of automated tool institutions with large collections can safely make more nuanced access statements on most of their collection without increased labour time of individually checking records. 5. Responses to the “GLAM-WIKI recommendations” are starting to come in. Catherine Styles who was with the National Archives of Australia at the time of the conference has recently published her personal response to the recommendations and they are awesome. They point out that in many cases Wikimedians would love to help and do things, in our own esoteric way, that would otherwise cost the institution considerable time and money e.g. digital restoration and metadata cleanup. A theme running through the response is a desire to see a toolkit or training package developed specifically for the GLAM sector to understand all the interlocking issues being raised. Not simply “how to edit” but also more fundamental things like “why not non-commercial”. 5 Responses to Part 1: Making Wikipedia "GLAM-friendly"
Links to this interesting blogpost are also available in the MuseumsWiki: Museums and Wikis, Museum Documentation and Wikipedia.de, and Museen und Wikipedia (German). Well, the Deutsche Nationalbibliothek (German National Library) doesn’t include Wikipedia biographies in the Name Authority File (PND), but links to it (e.g. http://d-nb.info/gnd/131856871).